Arundel and Elgin Communal Garden is part of the Ladbroke Estate, laid out as a planned garden suburb with a coherent layout of concentric crescents and large communal gardens whose features were first suggested in a plan by architect and estate surveyor Thomas Allason in 1823. His scheme was later modified by others, including James Thomson, although Allason remained involved until his death in 1852. Building started in the 1840s; the outer concentric crescents date from the 1860s. During the lull in building development, the land was leased for a time for a racecourse, the Hippodrome, which operated from 1837-41. 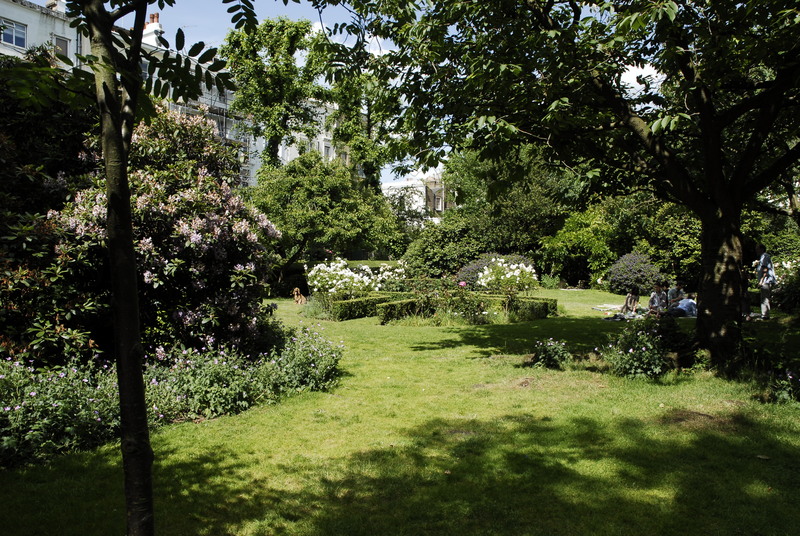 The garden has mature trees, shrubs and other planting, with a tall plane tree in the centre. Has taken part in Open Garden Squares Weekend 17 times, most recently in 2016. Arundel and Elgin Communal Garden is bounded by terraced houses on Elgin Crescent, built 1852 to the north and Arundel Gardens, built 1862-3 to the south, as part of the residential development of Ladbroke Grove. Small private gardens lead to a broad level communal garden dominated by a huge central plane tree. The oval enclosure surrounded by privet hedge is flanked by lawns backed by beds of flowering shrubs. The complex mid C19th path layout has been simplified and some of the original internal railings survive. Today it is an informal garden with mature trees, plants and shrubs still laid out to the original Victorian design shown on an old map of 1862. Protected under 1851 Garden Square Act.